If someone mentions the phrase ‘root canal’ to you, your immediate reaction may be fear or dread. The fact of the matter is that root canal therapy also known as endodontic therapy is a critical procedure to help save a tooth from failure and extraction. The signs of a root canal can be varied. Here are five signs you may need a root canal. Pain: Pain isn’t always an indicator of a root canal, but it can be. Regardless, any time you have dental pain, you should schedule an appointment as soon as possible. No Pain: Even without pain, an X-ray may reveal a lesion at the tip of the root meaning the tooth could be necrotic. Your tooth’s root canal is the space within the root of a tooth under the enamel crown of the tooth and below the gum line. The tooth root is part of the tooth substructure that consists of some dentin, the pulp chamber, the periodontal membrane, nerves, and blood vessels. People fear root canals because they assume they are painful. In fact, most people report that the procedure itself is no more painful than having a filling placed. 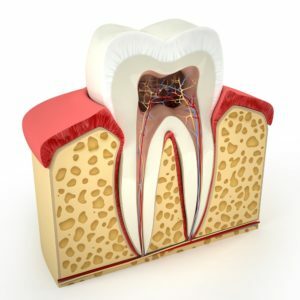 During the root canal procedure, the pulp, nerves, and any bacteria or decayed matter is extracted from the root of the tooth and replaced by special dental materials and often finished with a tooth crown to encapsulate the surface of the tooth. The aim of the procedure is to restore the tooth to its full, normal function. Typically, a root canal requires one or more appointments to the dentist or endodontist (root canal specialist). Root canals usually last a lifetime, but in some instances a tooth may have to be re-treated to ward off new infections. Regular brushing, flossing and dental visits will add life to your teeth and any dental restorations, as well as aid in the life of your root canal treatment.